It’s been called an epidemic. And rightly so. The statistics are staggering. According to the U.S. Census Bureau, 43% of children in America now live without their Father. And that number continues to grow. Research abounds on the possible effects of this reality—connecting Fatherlessness to everything from high school dropouts to substance abuse to incarceration. But more difficult to quantify are the internal effects. The decreased self-esteem. The fear of abandonment. The struggle to manage emotions. The need to control. The hesitancy to trust. Many Fatherless children grow into pleasers who fail to set boundaries. Many become perfectionists, keeping their external world in order, covering their internal chaos. Others become overachievers to prove to others and themselves that they are somebody. Minus the high school dropout, substance abuse, and incarceration, this was me to a T.
In many ways, though, I am not qualified to write on Father Loss. My Father didn’t leave. He didn’t die when I was young. And he treated me well. He was ever-present. Ever-positive. Ever-praising the littlest thing. And he really tried—in many ways. For example, he tried softball. He bought himself the biggest mitt he could find. The oversized glove hung on the end of his arm like the target on a dunking booth, and we played catch. When I didn’t hit the mitt square-on, I had to fetch the stray ball from the fence behind him, so out of necessity or laziness, I developed one of the best arms on my little league team and won the honor of playing third base. As it turns out, Dad was a pretty good coach. He also tried to be positive. I remember zipping his coat for him one cold day not too many years ago. As I tucked his scarf in around his neck, he nodded profusely and beamed and muttered, “Incredible! Incredible!” Peter and I joked that it was as if I had just metaled in an Olympic zipping event or descended from the heavens, a superhero with zipping powers. I suppose, from my Dad’s perspective, I had just accomplished a super-human feat. However, as positive and present as my Dad usually was, his Fatherly skills were limited—hindered by cerebral palsy and the resultant insecurity. To my young and immature eyes, he wasn’t a Real Man. Not the strong, take-charge, fix-it sort of Man I wanted him to be. He couldn’t pick me up, carry me, chase me around the yard, climb with me at the park, teach me to ride a bike, repair a broken faucet, stain our old deck, landscape our yard. But if his physical limitations were a bitter pill, his silence was far more so. His thick speech often rendered him mute. And the Real Man remained out of reach. He was so insecure that at any restaurant he would simply say “same” and order whatever I was eating. He was so afraid of being a bother that on family outings he would sit in the car for hours to “save us the trouble” of taking him along. His affirmations were so abundant and indiscriminate that they never felt true. He very rarely gave me guidance—and then, only when I asked. And I rarely asked. I might go to him for help with an algebra problem or a budgeting issue. He worked as an accountant and was most comfortable in the world of numbers. But when it came to more momentous matters, I was on my own. Consequently, when I arrived at the age of sixteen—the official “old-enough-to-go-out-with-boys” age as deemed by my parents—I stumbled into the world of dating with no knowledge of protocol and an insatiable desire for affection. My first real boyfriend was the seventeen-year-old Soccer Captain at my school. He was tall, outgoing, opinionated, funny, and—to my young eyes—a Real Man. Our first date was on a stormy October night. Since my parents preferred group dates, we had Godfather’s pizza with friends. And since my ability to go out with boys was contingent on my adherence to a strict curfew, we left the crowd in the restaurant and dashed out to his rusty Civic hatchback, the rain falling in sheets. Soccer Captain had spent the night before preparing his car for our date, working on the electrical system to be exact. And I was impressed; he fixed things. He was an athlete and a mechanic. Everything my Dad was not. My own Sir Galahad. The only chink in his armor that night was that he hadn’t reconnected the windshield wipers. We crawled down Hwy 55, unable to see ahead more than a few feet. Afraid that a breach of curfew would cut short our budding romance, Soccer Captain concocted a brilliant plan. He pulled the Civic under the cover of a First Federal Bank drive-up teller. Watching him dash through the rain to a neighboring 7-Eleven, I reveled in a new-found security. A Man—a strong, capable Man—was taking care of me. He returned, armed with a coat hanger. His nimble fingers twisted the wire, wrapped one end around the passenger-side wiper, and pulled the other end out straight. As we drove the rest of the way home, I operated the wipers—pushing and pulling the coat-hanger handle—with my soaking-wet right arm. When he dropped me off, Soccer Captain thanked me for being a good sport. I didn’t mind a bit. I wanted to impress him. I was hooked on his strength. I introduced Soccer Captain to my Dad one evening a few months later when he came to pick me up. Dad was in his wingback chair, reading glasses low on his nose, U.S. News and World Report on his lap. They shook hands—one palsied, the other powerful—and said, “Hello.” That was all, but I could tell that neither one was impressed. I was afraid Soccer Captain might break up with me after that meeting. I was afraid cerebral palsy might frighten him off. But he stuck around—for three long years. Over those three years, Soccer Captain taught me to change the oil, the tires, and the brake pads of my car. He taught me to drive a stick shift. He went biking with me, played hockey with me. Did many things my Dad could never do. Over those three years, he also took advantage physically, started drinking, borrowed my money, and unleashed his temper. Not that I was an innocent victim. Not at all. I was a desperate and willing participant with my own low self-esteem and fear of being alone. Over those three years, my Dad liked Soccer Captain less and less. I could tell because he furrowed his brow and pursed his lips at the mention of Soccer Captain’s name—but he never said a thing. Nor did I.
I finally broke up with Soccer Captain after a particularly brutal series of arguments during my sophomore year of college. But the pattern of my dating life was established—strong, but conflicted Men; a silent, but disapproving Father; and my resulting broken heart. There was the Volleyball Player/Accounting Major from California. I had dreams of him and my Dad bonding over the intricacies of internal auditing. But on our first trip to “meet the parents,” tax laws were not enough to spark their friendship. And Accounting Major broke up with me during our senior year of college when he was recruited by a Big Six firm. There was the Furniture Mover/Fellow Seminary Student. He met my Dad when he helped me move a couch back to my parents’ house. Seminary Student was kind to my Dad, albeit a little patronizing. But again, I could tell Dad didn’t like him. I remained hopeful until Seminary Student reconnected with an old girlfriend, lied to me, then wrote about it in his journal, which I found and read. Bad news, all around. Then there was the Opera Singer/Home Builder who deftly danced around commitment. I put off introducing him to my parents for a full two years. I did call home once, though, to cry when Home Builder was having second thoughts. It was after that phone call that I received my first Fatherly dating advice at the age of twenty-seven. It came in the form of a letter in which my Dad told me about the kind of Man he hoped I would find and how I should expect to be treated. At the time, I resented it. It was way too little, way too late. Besides, Home Builder had apologized and things were better. In the end, though, it took only one weekend at my parents’ house to send Home Builder running for good. It wasn’t me, he said. It wasn’t my parents, he said. It was him. But really—at least in part—it was my parents. It was my Dad—who wanted to be there for me but had no idea how. Whose distance left a black hole in my heart. And really—it was me. It was my white-knuckled grip. My desire to control. My emotional neediness. And my frantic attempt to fill that black hole, a space only fillable by a divinely infinite sort of love. By the time I met Peter in September of 1998, I had little confidence in my own judgment or relational ability. One of his professors introduced us in the cafeteria of the school where I was teaching and he was studying. We talked briefly over lunch—about Minnesota, drama, and traveling. He didn’t fit the profile. He didn’t fix cars or build houses. But he had been teaching elementary school in Pakistan. He seemed kind, intelligent, interesting, definitely intriguing. And his British accent didn’t hurt. We got to know each other over daily walks to the train station and increasingly long coffee stops along the way. Before we knew it, Christmas was approaching, and Peter could not afford to fly home to England. So I nervously invited him to Minnesota to meet my parents. He accepted. Just a few days before the trip, however, Peter appeared on my doorstep with an announcement. “I don’t think we should see each other anymore.” He thought he needed to focus on God. I was dazed and devastated. But I was determined to handle it differently. I wrote Peter’s name on a piece of paper. On another piece I wrote “marriage.” On another “love.” I laid the strips in a metal dish, a makeshift altar. Then I struck a match and watched them burn. For me, it was a symbolic sacrifice. A release of control. An exercise in trust. Peter spent the holidays alone in Chicago. He thought and prayed and asked if we could try again. We spent the month of January praying in earnest for our relationship. And in February I had another chance to introduce Peter to my Dad. In spite of our history, in spite of my fierce independence and Dad’s detachment, this meeting mattered. My nephew was turning two, and the family was gathering for a party at my brother’s home in Tennessee. Mom and Dad flew down from Minnesota, Peter and I from Chicago. And there in the Nashville airport, they met for the first time. They shook hands and said, “Hello.” Then Dad smiled. “I can push your wheelchair for you, Jack,” Peter offered. Dad nodded, and they were off. It was an image that brought tears to my eyes, an image I enjoyed seeing again and again as Peter found his way into the heart of my family, the image of these two men who were each—in their own way—teaching me about love. Ten months after that first meeting, Peter and I were married in Plymouth, England. Although it was a struggle, Dad made the trans-Atlantic journey with us—his first ever. On the flight over, we discussed the final details of the ceremony. There was one matter that I had been putting off. “Ok, well, we can even just wait and see how you feel that day.” I thought perhaps when he got there and saw all of the people, he’d feel differently. On the morning of our wedding, an old silver Packard transported my Dad and me to St. Mary’s Church. 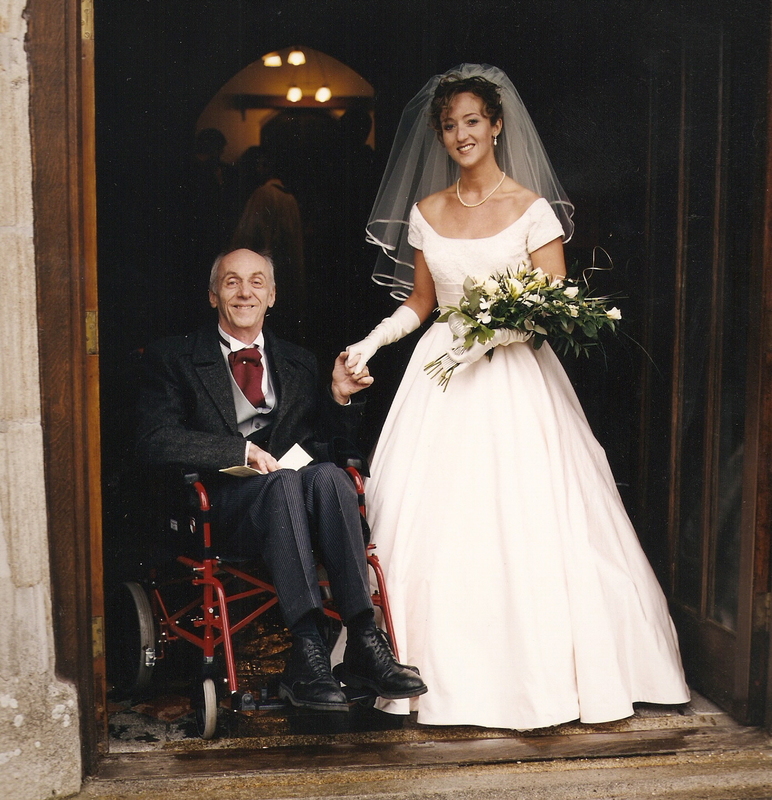 In England, the bride and her Father are the last to arrive, so the 13th century stone sanctuary was already full of people when we entered the foyer—me holding my dress up around my knees to keep it out of the puddles, my Dad being pushed in his wheelchair by my brother, the usher. The photographer snapped a photo of us and we took our places. “Are you sure you want to walk?” I whispered to Dad and received the familiar nod. He was already trying to stand, rocking back and thrusting forward to gain momentum. After a few tries, he was up. He took my arm, the “Bridal March” began, and we proceeded down the long aisle, pausing only a few times to wobble and regain control. It wasn’t a graceful or stately processional. But there wasn’t a dry eye in the place. The tears prompted—not by my bridal beauty—but by his bravery. When we finally reached the front of the church, the curate whispered to my Father that he could sit if he wished. But Dad insisted on standing. “Her mother and I,” my Dad proudly responded in his slurred tongue. Then the curate indicated that Dad could give me a kiss. I lifted my own veil, leaned over and put my cheek right in front of his lips. He tightened his grip on my arm as he tipped forward and pressed his puckered lips on my face. He nodded and muttered, “I love you too.” And—although I still struggle at times to accept love, to enjoy the outpouring from my husband and my God, to relax and soak it in and let it penetrate my soul—I do remember that moment. I remember the “I love you.” And I have no doubt that he did. What was the most important lesson you learned from your dad? If you lost your dad, what has been the effect? Beautiful, Kelli. Brought tears to my eyes. Relationships with dads and men are so complicated and so connected to our souls, I think. I related to your struggle to reconcile it all. My dad taught me how to apologize. He wasn’t always perfect or right. But he always said sorry when it was needed. Through him, I will never forget that strength comes through humility, and that healing comes through forgiveness. Since my Dad was a submariner, and was gone half the time under the ocean, I often felt the blow of his absence. I found men, boys really, who were willing to hold me, read to me, kiss me good night. I was profoundly needy and was never without a boyfriend. There was only one guy that my Dad ever got along with and he was the most abusive. My father actually bribed me with a puppy not to date my now husband. I never got much advice from him until my marriage fell apart and I called him in tears one lonely day. I never called my Dad. I told him between sobs that my husband had left and I didn’t know if he was coming back. How? How can I make him come back Dad? Daddy please, tell me how. You can’t make someone love you, but if you choose to let him back into your life, you have to tell him you forgive and mean it. That’s love. Forgiveness. That was 9 years ago. I’m still happily married. So, I guess it was good advice. Good advice, for sure. Thanks, Alex! Thanks for blogging—you give of yourself and we can all relate to your thoughts on various levels. Men, dads, husbands.. Being a daughter, being a wife…embracing and accepting the ups and downs. Marriage as a form of re-parenting? Another chance to get what we didn’t? Kelli, I have one more thing to say… Well, your post really bugged me, in a good way (from all days… on Christmas Day). Sometimes we are willing to write about things after we are done with them because the process can be really messy and we sound less than sanctified. So here is a “in the midst of junk” perspective. Growing up, I was good enough kid, never caused much trouble in our house. So running to my dad for help was usually in the context of me being wronged or hurt or whatever. But as I got older, it became harder to run to dad with my screw-ups . Even when I approached him in the most humble ways, eating the most humble pie in the world, my dad did not know what to do with his feelings of disappointment. He was okay offering some comfort during the very low points (didn’t want me to feel too bad), but it was more difficult when I no longer felt miserable and perhaps in his eyes did not earn the right to move on… It is like the penitence that goes on and on, no matter how much you’ve already repaid. But then I looked at myself and realized that it’s the beauty of what we call the “parallel process.” My dad are I are both working on accepting the other’s imperfection. I am accepting him as a disappointed father and he is accepting me as his disappointing daughter. I have been dethroned–still hurts a little, but far less pressure. This one made me tear up more than once while reading it. Can something be tender and precious and a little raw? I don’t know, maybe so. The lessons I learned were a mixed bag. Plenty of lessons were hard—the model of what not to do. A few were fairly good. I am a hard worker and fairly independent as a result of my dad’s influence. When I can do it, I like to be a great gift-giver. Though there may have been problematic motives, my dad gave great gifts because he could, and because he loved doing it. Can I just say again, I’m privileged to read this. Just honored. So true, Abi. I continued to process these things in a later post–“Say Something.” You might also resonate with that one. Blessings as you continue the healing journey.